With the convention drawing to a close, there has been a number of articles appearing online covering the event. One of the best – naturally – is by the BBC itself, on the BBC News Website. They also had a slideshow of images from the weekend. 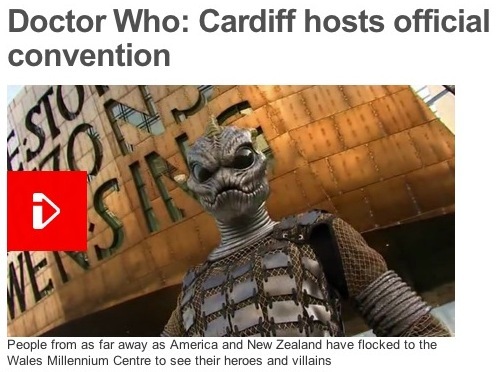 I was just thinking, who’s that handsome fella growing out of the Silurian’s neck? Having given myself the luxury of a ticket for both the Saturday AND Sunday of the convention, it means I could focus on different things each day. Yesterday I made the effort to be as close to the front as possible for the three panels, and got some great pictures in the process (see left). I attended the SFX demo; prosthetic demo and Restoration Team lectures in the lobby, so by the end of the day I felt I had got my money’s worth there. Today my focus is elsewhere, and although I will attend the panels again, I’m less concerned about being first through the door. This morning I took the TARDIS set visit, which was seriously the coolest thing ever (see right). It topped anything that happened yesterday, and I can’t see much exceeding it today, but we’ll see. We got back from Upper Boat in good time, and I joined the queue for the Meet The Stars panel. This time I was near the back, which was fine. The discussion was amazingly similar to yesterday, so I was able to soak up the atmosphere of the event. This view gives you some idea of the size and grander of the venue, as well as the size of the audience. So today I decided I’d spend a lot more time autograph chasing. 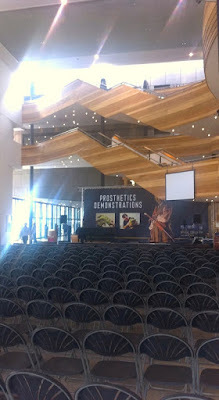 Later I’m due to meet Matt Smith for both photo and autograph, but in the meantime I’m after some of the other guests. These were signing for free in the lobby, with a regular circulation of guest on offer. I had a real nice chat with Nicholas Briggs, who I had previously seen at both Chicago TARDIS last November and again at Gallifrey One in February. I said how we have met more than once and tried not to sound like a stalker! Yesterday was a surprisingly smooth event. I got in on schedule and pretty much everything ran like clockwork throughout the day. First on my schedule for today is the TARDIS tour. I elected to go early on Sunday morning to minimise it clashing with any of the main events. There is a coach to take us to and from the studios, and I have an allocated place on the 8.15am departure, so I don’t need to rush down to the Millennium Centre like I did yesterday. The clocks go forward today as well, so by doing this tour it gives me a more relaxed start to my second day. Well that was the original plan. A few weeks before the event everyone had an email that the coach would leave at 8am rather than 8.15am, which was okay. I got there in good time and the queue had already formed so I found the end and was quickly checked in by the waiting crew. 8am came and no sign of the bus. Time was ticking on and 8.15am was not far off. Looks like I didn't need to rush after all. 8.20am and still no sign of the bus. One of the crew came to apologise, as the bus was delayed due to road closures in connection with the Sports Relief Charity Mile, which starts and finishes right by the Cardiff Bay water tower. 8.30am and still no bus, but we were now asked to walk around the corner to meet the bus. 8.40am and in the distance we glimpse the bus. It can be seen two blocks away - being stopped by security who seem to be asking it to turnaround! The bus doses a three-point-turn, and starts reversing down the road towards us. We then all move down the road to meet it, and FINALLY we we off - 45 minutes late. It takes a good 30 minutes to get to the Upper Boat Studios, which are some non-descript units of an industrial estate. We are divided into two groups, to make our on set time more comfortable. I'm in the red group - the second to get on set - so while we wait we have a coffee in the Blue Box Cafe, often seen on Doctor Who Confidential. It sounds glamorous, but it's more of a Welsh version of The Apprentice Bridge Cafe. While I'm in there one of the tour guides, who are all Upper Boat staff, remarked on my tweed, noticing it was more accurate than most she had seen, which was flattering. Finishing my tea it was finally time go on set! We walk around to the main entrance, and down some corridors before turning into the studio. To a collective gasp we are confronted by the back of the set, constructed of wood and scaffolding, with a bright internal glow. Around the side there is a series of ramps up to the TARDIS exterior doors, and following a quick briefing we were invited in. The costuming part of conventions are very different on opposite sides of the Atlantic. Halloween in America is almost as big as Christmas, and there has developed a modern tradition of dressing up in all manner of costumes, not necessarily as witches, ghosts or vampires. 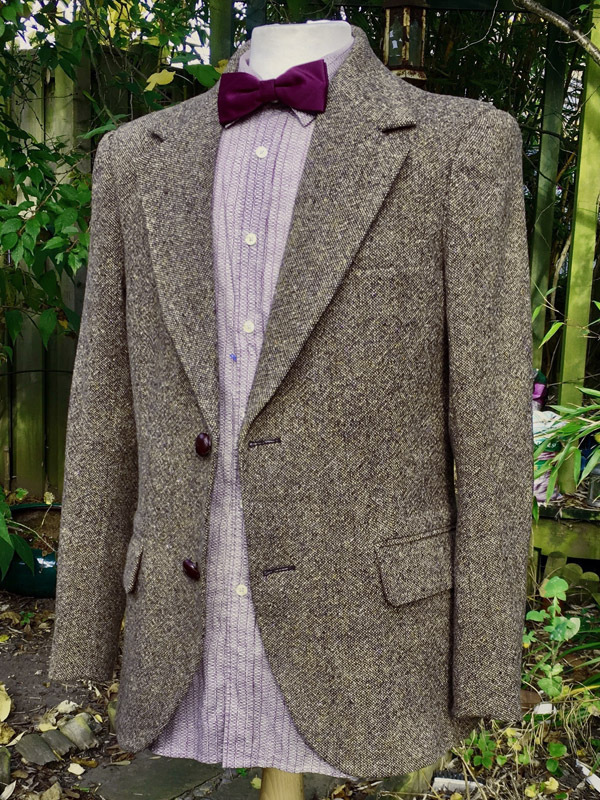 I think it is this ethos that has permeated into the costuming side of American Doctor Who conventions. 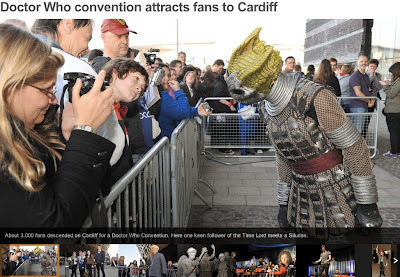 In the UK, on the other hand, we don’t have the ingrained desire to dress up, so our conventions have a much lower percentage of cosplayers in attendance. 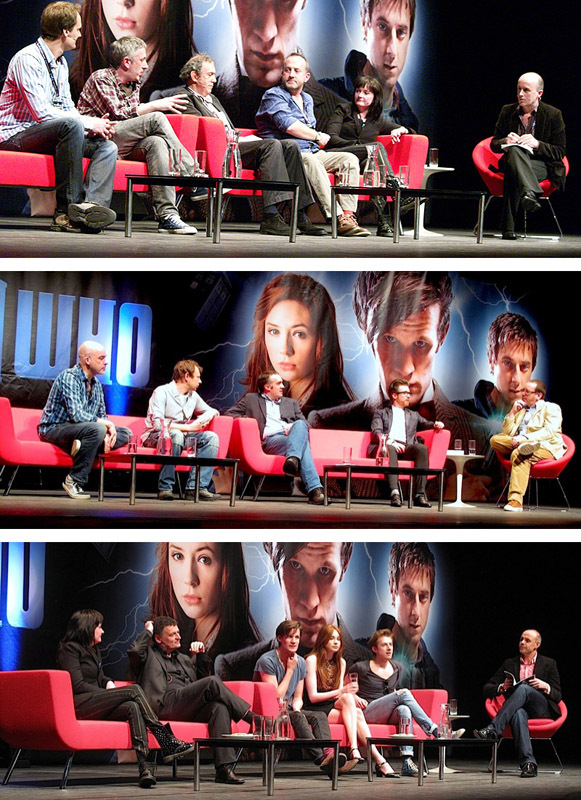 Until recently, I hadn’t actually done that many Doctor Who conventions in the UK. In fact, I’ve been to more in the US than home-grown ones! 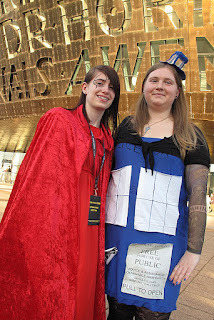 So it was this months Official Cardiff Convention was a contrast to Gallifrey One a couple of months back. That said, I saw a number of Amy Ponds, but here are my two favourites. As it happened I caught up with them later in the day for a great photo shoot outside the Millennium Centre. 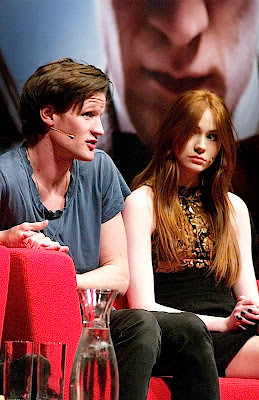 Check out Matt Smith Ganger. 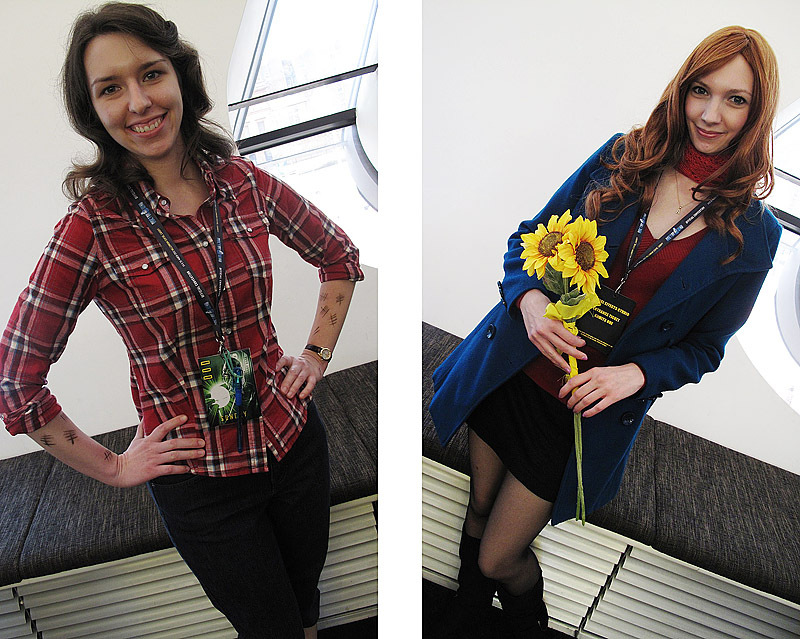 Wherever there is an Amy Pond, there is sure to be an equal number of Matt Smiths, and Cardiff was no exception. 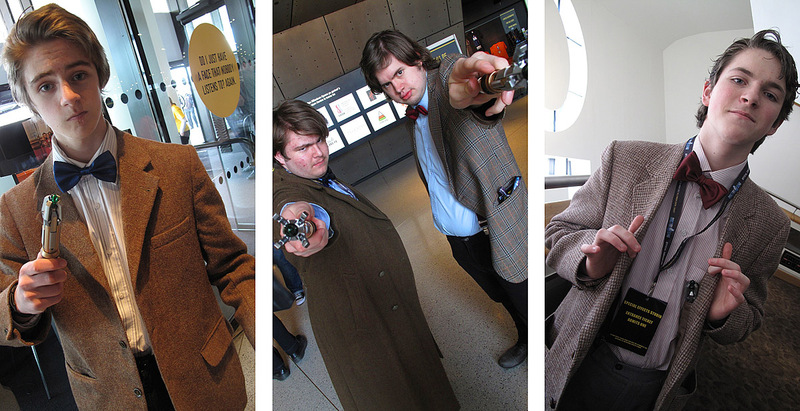 Bow ties and tweeds were out in force, along with the obligatory sonic screwdriver. 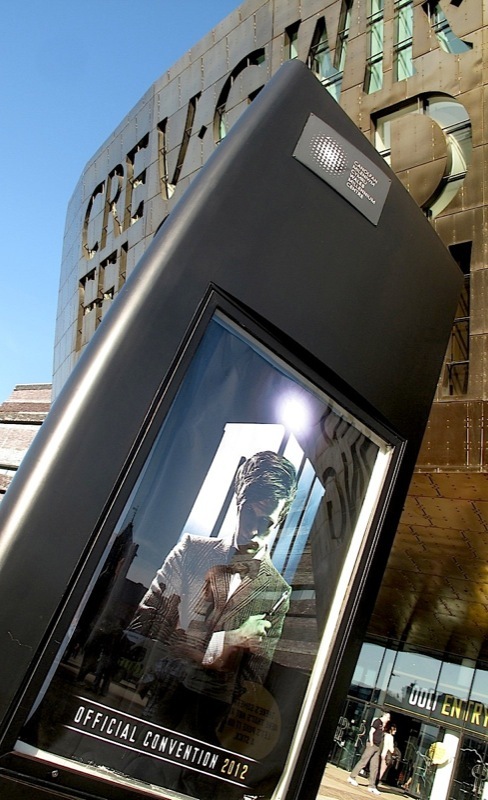 The Cardiff Millennium Centre is a pretty big building once you are inside, and the organisers made good use of the facilities. 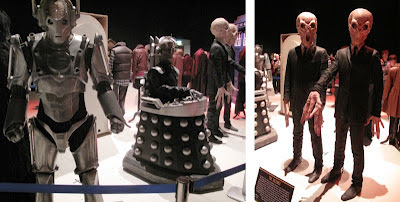 Tucked away in a room near where the SFX Demo took place was a cut-down version of the exhibition, last seen as part of the Doctor Who Experience at Olympia. 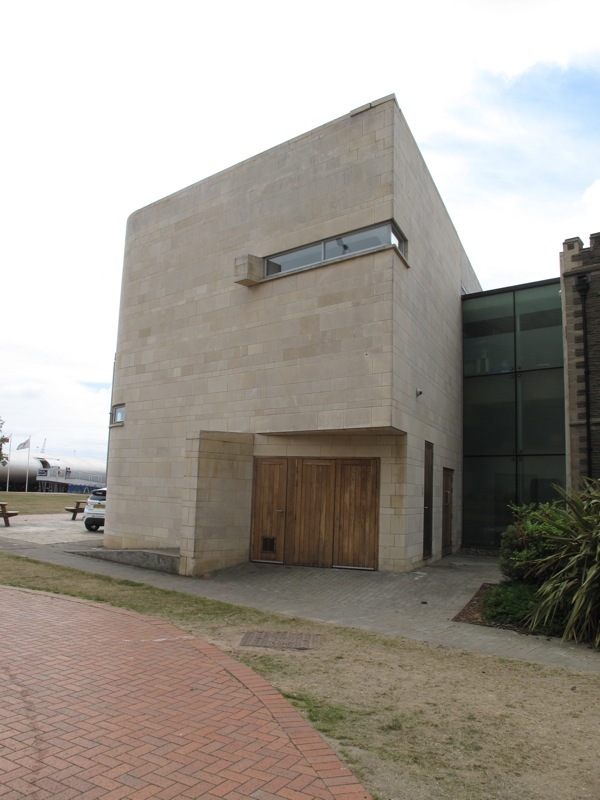 The experience had close in late February 2012, and is due to reopen at a purpose-built venue in Cardiff Bay later this summer. This has left the contents of the exhibition in storage while the new building is constructed, so for the Convention as much as possible has been put on display here for everyone to see. Here is what was on show. In the centre of the room was a display of mainly Doctors and companions. The first thing you could see was the Matt Smith TARDIS, flanked by his series five costume (without the creepy head) along with the David Tennant and Christopher Ecceslton. 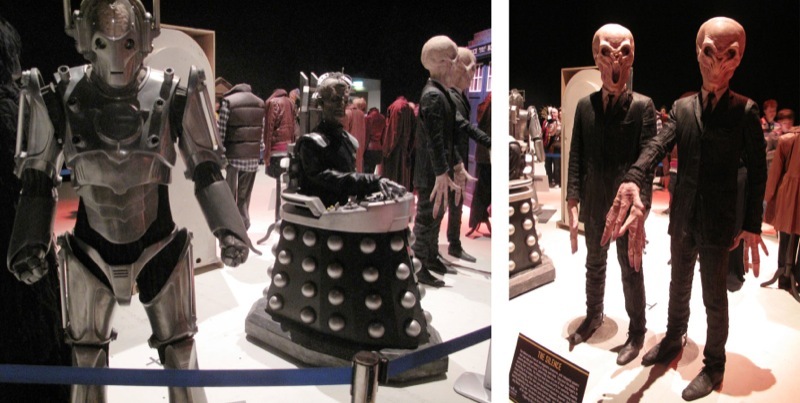 Next to them stood The Silence, Davros and a Cybershade with a Cyberman on each side. 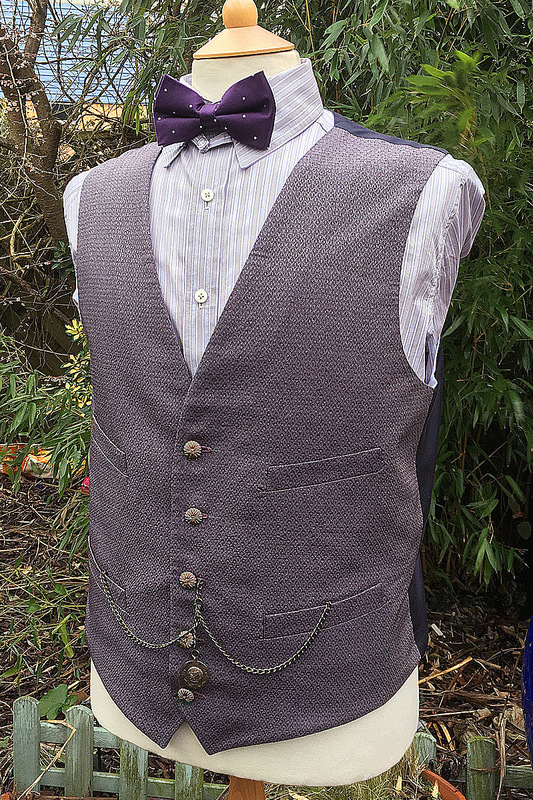 Around from the Cybermen was a cryogenic cabinet from A Christmas Carol, followed by a line of companion costumes. On show were Rory from The Hungry Earth; Any Pond’s outfit from Victory Of The Daleks; River Song’s dress from The Time Of Angels; Donna Nobel’s trademark brown leather coat; Martha Jones’ iconic burgundy leather jacket outfit; Captain Jack Harkness; Rose Tyler from Stolen Earth; and Sarah Jane Smith from School Reunion. Coming back round to the Matt Smith TARDIS, the line up was completed with K-9 from School Reunion. So the day has finally dawned. Booking opened on the ticket back on 14th November last year, so it’s been over four months coming, so I can’t believe today is the start of the first official Doctor Who convention. The convention opens at 9am, with the first timetabled event at 9.30am. I don’t want to be stuck at the back, so I got up bright and early and was down at Cardiff Bay by 7.30am. The queues had barely begun to form, so it looks like getting up early has been worth the effort. To maximise the number of people through the door, but keep a cap on crowds, they are running two identical programmes in parallel, with the same event taking place at different times. These tracks are labelled OOD and SILURIAN. Today I’m Ood (tomorrow I’m Silurian) so I found the right queue I was only 14th in line for entry! That’s a relief, but a long wait ahead. 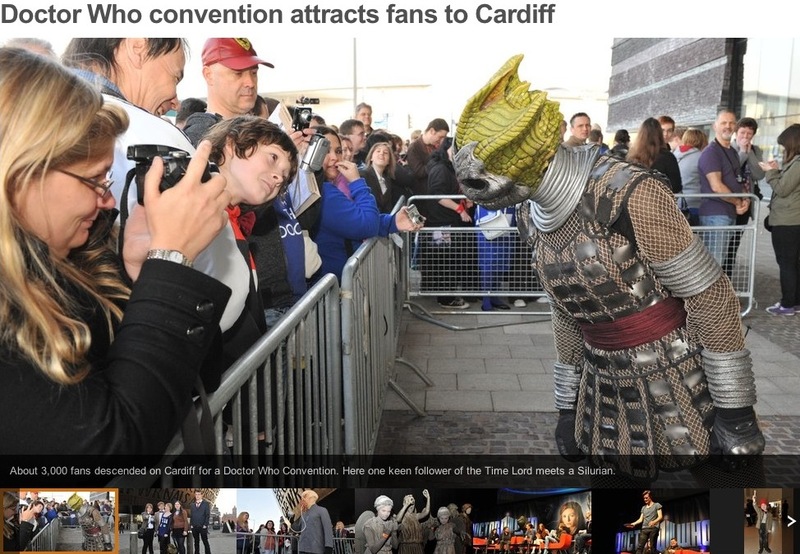 While waiting for opening time, we were kept entertained by the obligatory costumed Ood and Silurian who peered at the waiting fans and posed for photographs. At the side a queue for the TARDIS tour formed, and off they went in their coach - that will be me tomorrow! 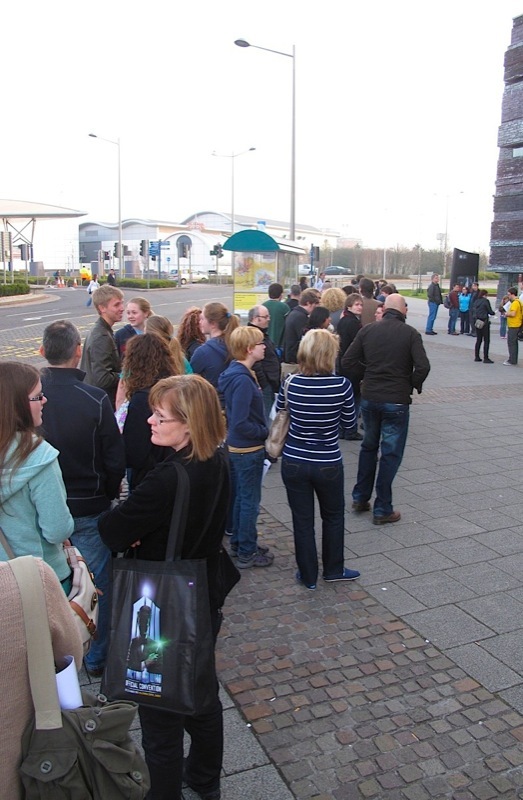 Slowly the queue built up behind me, snaking off around the corner of the Millennium Centre and out of sight. About 20 minutes before opening, the event crew started moving down the line and checking tickets, compressing the line as they went. Then it was time - the doors opened and we were ushered in. We were quickly guided up to the Donald Gordon Theatre, the largest auditorium in the venue. Being so closet the front of the queue, I was able to get a front row seat. Well today I stated a new job! Don't worry, I'm still a tailor and don't plan to change that any time soon, but what I have done is add a new feather to my cap. If you are a regular reader of my blogs you may have seen a couple of years ago I went on a guided tour of the Cardiff Doctor Who locations. 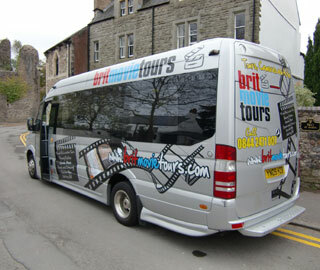 I went with Brit Tours, who as well as their Doctor Who tours, organise tours based on other popular film and tv franchises such as Harry Potter, James Bond and Notting Hill. 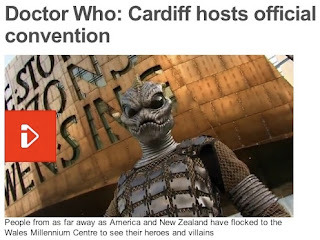 I enjoyed the tour, but felt it could have been a bit better and the tour guide a bit ore knowledgable (we walked straight past a Torchwood location in Cardiff Bay which I had to point out). Not wanting to detract from what they were doing, I drop them an email - not complaining, just suggesting it could be better, and I could be the one to help out! I didn't get a reply, but over a year later I did receive an email following up on my offer. To cut a long story short, I met the organiser of Brit Tours and explained my situation. He realised I would be perfect to handle the London based tours they run, as well as being available for private tours that are arranged for small groups. This week I got a call that a family of five were in town for a few days and wanted to see the sights of London through a Doctor Who lens. Usually the tours are on a mini bus, but this would need to be awaking tour, something I had done often for friends and fans in the past. Bob Mitsch, Ian Cummings and Mark Ferris all enjoyed the chance to walk in The Doctor's footsteps. Being on foot the locations we could visit were a bit limited, but we got in a decent number in the afternoon. 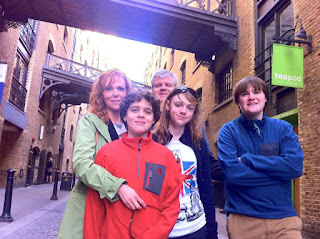 The family who were in London from Ohio, was made up of Jennifer and Bob, and their children, Sam, Jessica and Michael. Sam was the big Doctor Who fan, so the tour was. Any for his benefit. I chatted to him the most and I think he appreciated a willing ear for his outpouring of Doctor Who fandom. I was more than happy to recount my favourite episodes, Doctors, assistants and locations. 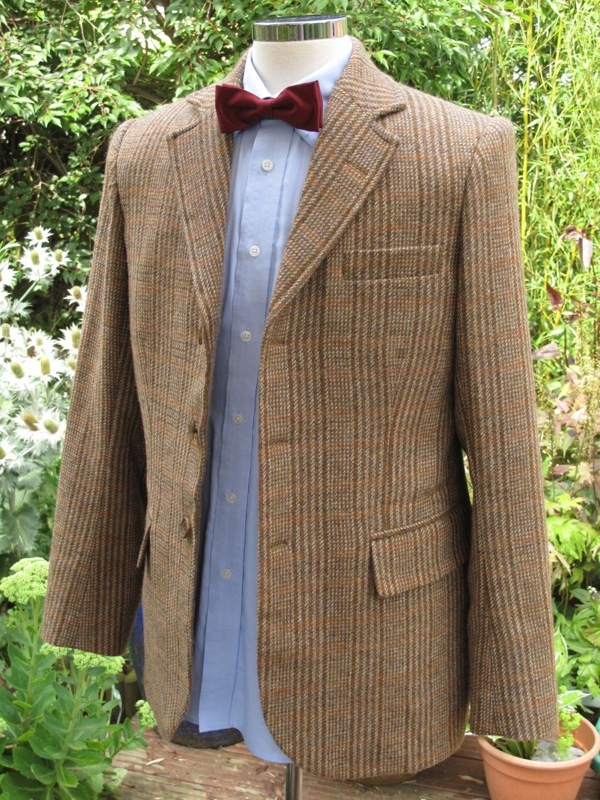 I was having a browse on eBay this week and came across a couple of listing showing there is still a supply of ‘original’ series five item, if you look hard enough - and have deep pockets. 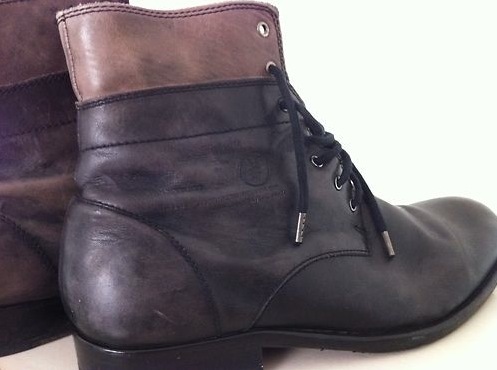 Firstly I found a pair of All Saints Layer Boots, size 10/10.5. The US based seller started them at US$49, with an undisclosed reserve. From what I can guess, a buyer did a deal with the seller, and the listing was pulled, before being reposted with a fixed price of US$475. Remember these boots were around the £120 price tag when new. Up for auction is the VERY RARE damn near impossible to obtain pair of original ALLSAINTS SPITALFIELDS "LAYER BOOT", the very same pair as seen on Matt Smith in DOCTOR WHO series, this boot style was also his personal pair off set at the time. These have been long out of production by AllSaints and have been pretty much scarce on the secondary market since. This pair is a UK/EU 44, the rarest and more desirable size to find. If you were a 10-10.5 or even 11 US they should fit great. This pair has the Vibram rubber bottoms professionally placed to match Smith's as the 11th Doctor and also, well, to keep you from slipping. Note: the "worn in" look is part of the style on the boot. Please make sure you know your size and read my description carefully. Stand out with Cosplay with the REAL DEAL! these are virtually impossible to come by now, don't miss out! So, I was up in Oxford Street yesterday, doing a bit of fabric shopping; visiting some suppliers; and just generally browsing around. Luckily I wasn’t around when the Kate Moss hoarding collapsed on passing shoppers! But while I was on London’s leading retail street I did drop into John Lewis. 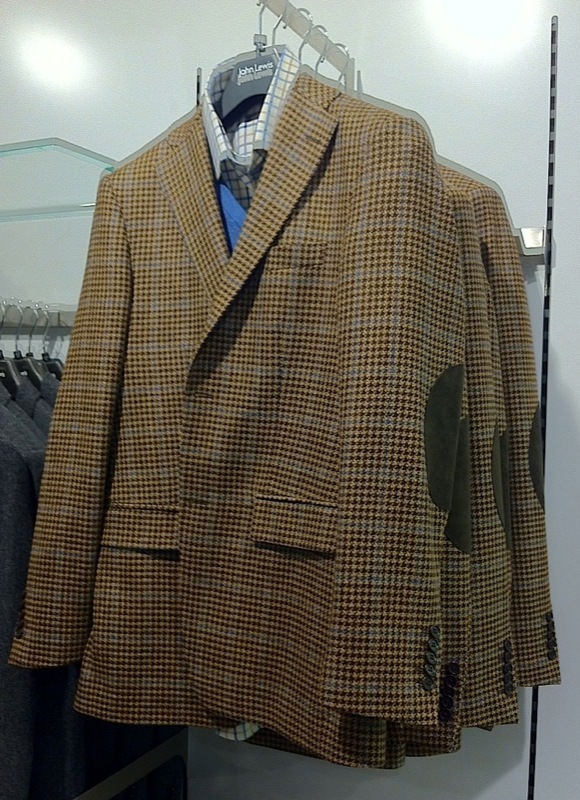 Looking around the menswear department I was struck by how many tweed jackets with elbow patches were on the rails. 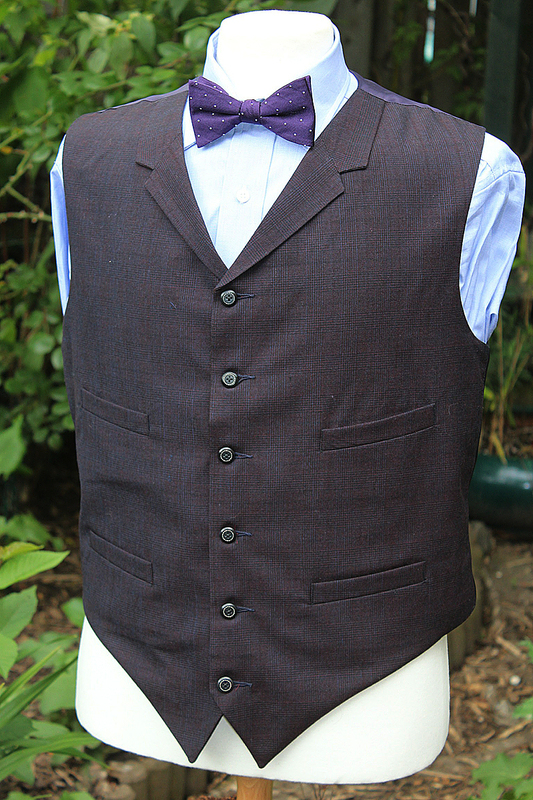 It wasn’t just one isolated option – there was a whole choice of colours and fabrics, as well as makers. This is quite a nice jacket, with flapped outer pockets, dark brown elbow patches and a notched collar. 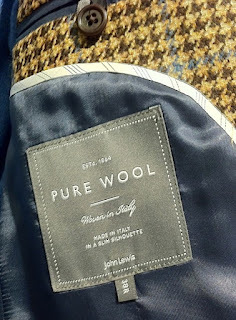 On the downside it does have five buttons on the cuff vent and looking at the label it isn’t a genuine Scottish or Irish tweed, having been woven and made in Italy.